Another Wooden Kii found, 1868. 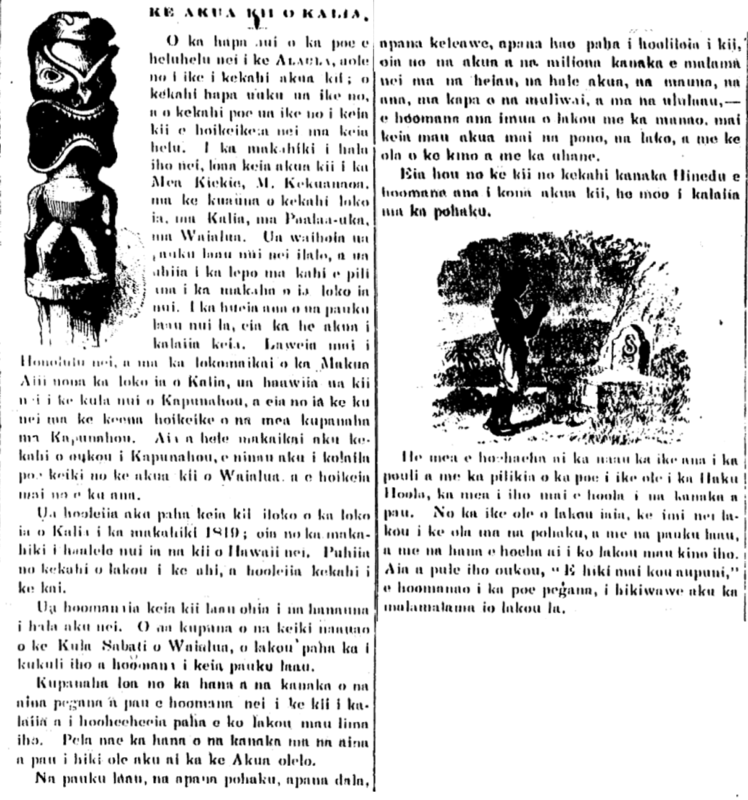 Most of the people reading Ke Alaula have not seen an akua kii, but a small fraction have seen one, and some of you saw this image that is shown here in this issue. Last year, this god idol was found by the Honorable M. Kekuanaoa on the banks of a fish pond at Kalia in Paalaa Uka in Waialua. That large piece of wood was set down and covered with soil near the sluice gate of that large fish pond. When that big piece of wood was unearthed, lo and behold, it was a carved god. It was brought to Honolulu nei, and through the goodwill of the Alii Elder who owns Kalia fishpond, that kii was given to the college of Kapunahou [Punahou], and there it stands in the exhibition room of curiosities at Kapunahou. When some of you go to visit Kapunahou, ask the children there about the kii from Waialua, and it will be shown to you where it stands. This kii was probably thrown into the pond of Kalia in the year 1819; that is the year when there was the kii of Hawaii nei were greatly abandoned. Some of them were burnt in fire and some were thrown into the sea. These ohia wood images were worshiped by previous generations. The kupuna of the educated children of Waialua Sunday School were probably those that knelt down and worshiped this piece of wood. How astonishing are the actions of the people of all of the pagan lands, who worship idols that are carved or molded by their own hands. That is how all lands are where the word of God has not reached. Pieces of wood, fragments of rock, chunks of silver, chunks of metal, or perhaps chunks of iron turned into images—those are the gods cared for by millions of people, in heiau, houses of god, mountains, caves, banks of rivers, and in forests; they worship before them thinking that from these gods come well being, wealth, and life in body and spirit. Here also is a picture of a Hindu man worshiping his godly image; it is a snake carved into a rock. This is something that pains the heart to see the darkness and trouble of those that don’t know of the God the Savior, the one who came down to save all man. Because they don’t know him, they seek salvation from rocks and pieces of wood and from actions that hurt their very own bodies. When you pray, “Thy kingdom come,” remember the pagans so that the light reaches them quickly. Ke Alaula, Buke II, Helu 10, Aoao 39. Ianuari, 1868. This entry was posted in Alii, Archaeology, commentary from this blog, Illustration, Missionary, Religion, Repost, Social Commentary and tagged akua kii, Bishop Museum, Kalia fishpond, Kapunahou College, kii, loko ia, loko ia o Kalia, Mataio Kekuanaoa, ohia, Paalaa Uka, Punahou School, Waialua, wooden image by nupepa. Bookmark the permalink.